The Boise State University football team is doomed. No more Statue of Liberty trick plays. No more postgame player-cheerleader marriage proposals. No more disorienting, slightly psychedelic nationally televised games on the school’s signature blue artificial turf. Just a rapid, underfunded slide into irrelevance—away from spotlight contests like Thursday night’s season kickoff against the University of Mississippi, and toward a dystopian future of unmanageable expenses, fan indifference, and eventual abandonment of the sport altogether. In the wake of a power grab by the big money football conferences and a recent ruling in the antitrust lawsuit brought against the National Collegiate Athletic Association by former University of California, Los Angeles star Ed O’Bannon, college sports are in a state of flux. And for mid-major programs like Boise State which have made hay against major conference teams, it's more like a state of panic. Rich schools, the nervous logic goes, are poised to become richer, gorging on gargantuan new television contracts. At the same time, amateurism’s slow death means player prices are about to rise. The end game? 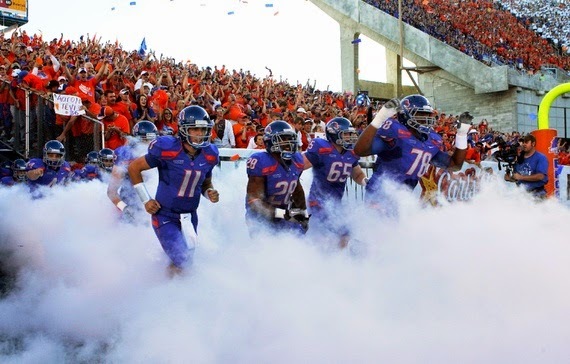 Less affluent schools like Boise State effectively will be pushed out of the Division I football and mens’s basketball markets, unable to keep pace with increasing costs, akin to middle-income workers who no longer can afford to live in Silicon Valley. Buh-bye, Butler University basketball. That’s the fear, anyway. In reality, not much will change. First, the case for hand-wringing. As Taylor Branch detailed so thoroughly in The Atlantic three years ago, the current college sports economy is rooted in amateurism. It’s basically price-fixing. A cartel of schools—dub it a union, but only if you want to rile up House Republicans—calling itself the NCAA sets the maximum compensation for the likes of University of Oregon quarterback Marcus Mariota or Florida State University quarterback Jameis Winston at the value of their athletic scholarships. Never mind if Alabama, Louisiana State University, and the University of Southern California are all competing for the same blue-chip high-school linebacker—thanks to amateurism, said quarterback only can be offered tuition, room and board, and not an unauthorized plate of pasta more. Earlier this month, however, the NCAA Division I Board of Directors voted for greater power-conference “autonomy,” which basically allows the 65 schools that earn the bulk of the football television money to give athletes larger scholarships and increased medical benefits without breaking away from the association as a whole. Why the shift? Think preemptive strike. A day later, federal judge Claudia Wilken ruled in the O’Bannon case that the NCAA no longer can prevent member schools from awarding athletes cash stipends that cover the full cost of attendance, nor prohibit schools from placing a minimum of $5,000 a year into trust funds that can be accessed by football and men’s basketball players following the end of their playing eligibility. The upshot? By the time Wilken’s ruling goes into effect in 2015-2016, coveted recruits who once could be had for the fixed price of a scholarship will now command the higher (but still fixed, alas) price of a larger scholarship and up to $25,000 in deferred compensation. Which is where the anxiety comes in. … the other 286 Division I members soon met with financial ruin. Post-2014, when a mid-major recruiter offered a scholarship covering just tuition, books and room and board, prospects would laugh him out of the living room. And when the big boys bumped up their support every few years—“Just keepin’ up with inflation,” cracked Birmingham pork-rind baron Jocko Broadwad in ’18 —other schools were forced to follow, or at least try to. First with cash. Then with cars and clothes, because those are part of “the full cost of attendance” if a college bro’s to be taken seriously. Meanwhile, the efforts of the 27 other leagues to consummate jersey and video-game deals were unavailing. Anyone condemned to play for a mid-major knew that his school had a Billiken’s chance in hell of delivering any trust-fund cash upon graduation. Wolff’s scenario is a bit extreme, likely exaggerated for effect. Still, it’s not that far off from what actual college sports administrators are saying. In a recent New York Times article, Fresno State athletic director Thomas Boeh told writer John Branch that “clearly we are moving away from parity. We are certainly moving to a Darwinian model.” Baylor University President Ken Starr—yep, that Ken Starr—informed Congress earlier this year that “if antitrust principles and collective bargaining eliminate pro-competitive limitations on payments and benefits, there may literally be no 'competitive' intercollegiate sports." Literally! During the O’Bannon trial, both NCAA and university officials insisted that amateurism restraints on athlete compensation were not only necessary for ensuring competitive balance among schools, but also for the very survival of college sports. (In one memorable pre-trial statement submitted to Wilken, Big Ten commissioner Jim Delany claimed that his conference would drop down to Division III in a world without amateurism. He later admitted that conference lawyers wrote his statement. Take that for what you will.) Again, the logic is the same: Allow richer schools such as Ole Miss to spend more money on athletes, and poorer schools like Boise State won’t be able to keep pace, or even afford to stay in the game. All of which sounds reasonable, except for one thing. College sports already are imbalanced. And they’re doing just fine. Actually, college sports aren’t merely imbalanced. They’re practically rigged. Occasional upsets aside, big schools dominate the highest levels of competition. College football hasn’t had a mid-major national champion since Brigham Young University in 1984, while in men’s basketball, more than half of the Final Four appearances between 1979 and 2011 were made by just 12 power conference schools. The disparity is due to talent differences, which mostly come from recruiting differences. In 2011, economist Andy Schwarz examined the school choices of the top 100 high school football prospects over a 10-year span. Of 1,000 total players, 993 went to power conference programs—and of the seven remaining, four were Mormons who attended BYU and one was an Ohio State University recruit who had a scholarship offer rescinded because of (later disproven) criminal charges. Of course, none of this is surprising. Anyone who follows campus sports knows that the University of Kentucky does not compete with Ball State University for the same basketball players, anymore than Ohio State competes with the University of Akron for the same football players. To the contrary, Kentucky and Ohio State compete for one level of athlete, while Akron and Ball State compete for another, lower level. Richer schools have more to offer, like super-swank basketball dorms. Poorer schools make do, and sometimes make good with undervalued prep players who mature into college stars. As NCAA president Mark Emmert once said, “I don’t think any of the Butler kids were recruited by, you know, Kansas.” Why does that matter? Because it won’t change, regardless of players being allowed to be paid. The schools with the most money will still fight over five-star prospects; everyone else will continue squabble over the leftovers. An old joke holds that if you encounter a hungry bear while hiking, you don’t need to run faster than the bear in order to survive. You just need to run faster than the person next to you. The same holds true for college sports sans amateurism. To land the nation’s No. 1 high-school linebacker in a truly free market for talent, Alabama (2013 athletic department revenues: $144 million) may have to spend quite a bit of money to outbid wealthy rivals like LSU ($117 million) and UCLA ($84 million). But that doesn’t mean Boise State will have to break the bank to land the country’s 250th-best prep linebacker—not if the Broncos ($43 million) are simply trying to outrun Fresno State ($34 million). Worrying that financial competition between Kentucky and Ohio State will force cash-strapped Gonzaga University to abandon hoops is like worrying that a future arms race between the United States and China will force Canada to disband its military. It’s possible, sure. But not very likely. Especially not when successful mid-major football and men's basketball teams are tremendous university marketing tools, and while a proliferation of sports networks with programming time to fill and cable subscriber cash to pocket means even the decidedly unglamorous Mid-American Conference can sign a rights deal with ESPN worth more than $1 million annually. In her 99-page O’Bannon ruling, Wilken found that “the NCAA’s current restrictions on student-athlete compensation do not promote competitive balance.” As supporting evidence, she cited near-universal consensus among academics and economists who have studied the issue, some of them for decades. Given that’s the case, why do so many college sports officials—some of whom work at the same universities as said academics—insist otherwise? Why do so many people who work around healthy competition fear the same, at least when it comes to player compensation? Like any type of salary cap or cartel restraint, amateurism is great for the people who get to enforce it—provided they don’t have to abide by it themselves. In major college sports, the money keeps increasing. March Madness nets the NCAA about $774 million annually. ESPN reportedly will spend approximately $5.64 billion over the next 12 years to broadcast the new college football playoff. All that cash has to go somewhere, and when a powerhouse like the University of Texas can’t directly buy the services of the premier high school players, it’s liable to spurge on the next best thing: According to a new book by ESPN radio host Paul Finebaum, the school recently considered offering Saban, an unparalleled recruiter, a salary package worth $100 million. Meanwhile, Boise State football coach Bryan Harsin is set to earn only—ahem—$1 million this season. Is anyone in college sports gnashing their teeth that big schools can—and do—spend more on coaches then smaller ones? “Are we at all worried that Fresno State isn’t able to outcompete Stanford for the best engineers?” Schwarz says. “Does Fresno State quit offering engineering classes just because it produces less prestigious engineering graduates? In 1984, Oklahoma and the University of Georgia sued the NCAA over its then-unilateral control of televised college football, which fixed the price of game broadcasts and placed a cap on the total number of televised games. The schools argued that association’s restraints were bad for the sport and consumers alike, producing less choice and output. Meanwhile, the NCAA maintained that its monopoly was necessary to preserve competitive balance—that without it, smaller schools would be left behind. Sound familiar? The case went to the Supreme Court. The association lost. Twenty-three years later, Boise State defeated Oklahoma in the Fiesta Bowl, pulling off one of the most thrilling upsets in college football history. So much for doomsday.